With the options of radiant heating systems on the market it is important to know their differences in heating comfort and energy efficiency. Whether it is hot water tubing, heating cables, or a mat, homeowners might think all radiant heating is essentially the same. But there are considerable differences in the way each heats a home. 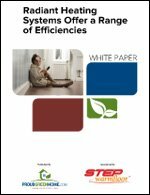 This white paper takes a look at some of those differences and identifies which radiant heating systems should be considered for your home.